Scott Lazer was just an aspiring filmmaker and J. Cole fan when he went to see him perform in Charlotte in 2013. Eager to impress, the Rutgers University grad brought storyboards, and through a chance encounter on the loading dock, presented them to the Dreamville team. That meeting produced little, but five months later in Los Angeles, they reconnected at a production house tasked with editing a now-shelved documentary about Cole’s life and career. Though that documentary never came out, it lead to Lazer directing Forest Hills Drive: Homecoming, which aired on HBO in 2015. Now, the 29-year-old works as Dreamville’s in-house filmmaker, where he produces and directs. Increasingly, though, he’s sharing the director’s chair with Cole himself. They collaborated on the 4 Your Eyez Only companion documentary (which also aired on HBO), a handful of music videos (including Royce Da 5’9’s “Boblo Boat”) — plus Cole’s videos for “A.T.M.” and “Kevin’s Heart” (starring Kevin Hart), from Cole’s new record, KOD. How did J. Cole start directing? From the first couple weeks that I started working with him, it was clear he had a very keen interest in filmmaking. The first video that I directed for him, “Apparently,” we edited that together in his hotel room in London while we were on that press tour for 2014 Forest Hills Drive. We finished it at like two or three o’clock in the morning and I could tell he was completely juiced about editing. He asked me what else we could do and I didn’t know what he meant; like, we’d only shot one video. But I’d been shooting all this other stuff, so he just said: ‘Well, mess around with this song.’ So, he gave me the “Intro.” I had shot him riding his bike around Manhattan. I thought maybe that could work. So, we just cut in one shot of him riding his bike around the city. It felt good. It felt like the right tone. And we cut that video in like 30 minutes. When we did the 4YEO documentary, he was even more involved in the conceptual phase of it, with production and then into post-production. He is a visual artist and I’ve gained filmmaking insight from him. People have told me one of my signatures is really long shots and I totally got that from him. Because we were cutting “Apparently” and I had this really cutty version and he was like, Let the shots play, man; they’re great shots, just let ’em play. He said: You should trust your shots. I was like: Trust your shots? You’re a rapper, bro. But it was pretty eye-opening. What was it like to work together on the video for “Kevin’s Heart”? Can you talk about the Kevin and temptation aspect a bit? Yeah. Enormous ridicule. And somebody that I think is pretty much well-liked became all of the sudden a devil to a lot of people. So, that was kind of the thinking for the video. 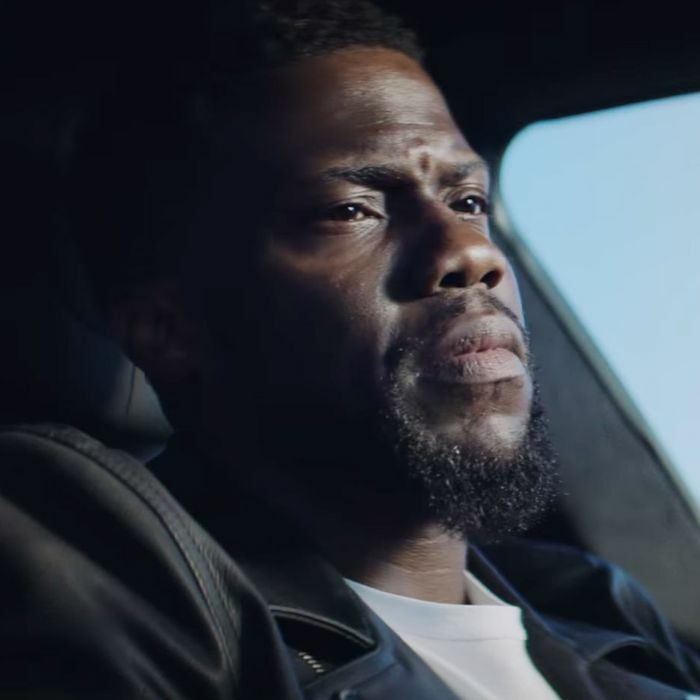 I mean, just having Kevin Hart in a video for a song called “Kevin’s Heart” is gonna be awesome; but like, how can we make that stronger? What do you think it is that allows Cole to direct people well? If Cole feels like it isn’t real or doesn’t speak to the essence of what the song or the video should be about, he’ll say it. He has no problem saying what he thinks, especially about creative stuff. Also, people say this all the time about celebrities — that they seem normal, but he is very grounded in reality. There’s a quality that I always appreciate in people and that is reasonableness, and he is very reasonable. He’s very capable of understanding different sides of arguments. Even when he’s on one side of an argument and someone’s on the other side of an argument. I think what that comes from is an ability to empathize. I think his ability to get on the level with others and not think of himself as above anyone allows him to reach people in a way that others in his position might not be able to. And he’s a storyteller; I mean he’s been working for a long time to get good at storytelling so I think that work just translates to other media. Did his presence make it easier for you to deal with Kevin? If it was just me, I might have been a little more cagey. But Kevin was great. From the moment I saw him he was just, like, down. And we had a call with him a few days before and I walked him through the whole treatment and he was laughing the whole time; it’s a funny video. It’s meant to be weighty, but it’s Kevin Hart so there’s going to be comedy in it. When I was walking him through the creative, I just heard him giggling to himself on the other end of the line and I was like, all right, it’s good vibes, he gets it and he’s gonna be good. Considering how divisive the climate is right now, was there concern about putting Kevin in the video? For sure. That dominated the conversation. We didn’t want it to look like, “Poor Kevin, his life is so hard.” And it’s not meant to do that. I think that’s why I tried to conceptualize it in my head that — it’s not about him necessarily. It’s about how these types of conversations tend to go these days where you’re only on one side of the spectrum and there’s no nuance or gray area in the conversation. So, he was just a really great candidate. A character to make that point. Yeah, because he had that experience. But we didn’t want it to look like we were trying to have a pity party for Kevin Hart. Did Kevin say anything about that? Not to me. He may have said something to Cole, but he didn’t say anything to me. He was down. From the moment I first talked to him, he was into it. There were a lot of concerns about that. But at the same time I was excited by the fact that this could be very controversial. He makes a Hitchcock cameo. But back to that earlier question, my point is: We were very conscious of Kevin and it was a combination of wanting to be sensitive, but also hopefully encouraging a more nuanced conversation in response to the video. Obviously we’re not going to solve the bipolar disorder of public conversations these days, but at least we can comment on that commentary.